Check-In: 3:00pm or after, Check-Out: 11:00am. *Occupancy: Limited to number of persons listed on rental home/permit. You may be asked to leave without a refund if maximum is exceeded. If police are called for any complaint a fine of $2,000 may be issued. *Parking: Cars shall only be parked in paved parking places (not on grass, dirt, etc.) and limited to number of spaces provided for this particular property. *Trash: Do not place plastic bags outside for trash pick up. Only leave trash in cans at curb side the morning of pick-up. If home has a bear box you can leave trash inside anytime for pickup as long as it is locked back up. Any excess trash remaining at time of departure should be left inside the garage or kitchen. ** Any guest who violates the City ordinance and causes a neighbor to take legal or other action against the owner of the property, will be directly responsible for any of the owner’s fees (legal or other) until the situation is settled in or out of court. Payment: A payment is due within 2 days of reserving a property, with the full balance of rent, tax and cleaning due 30 days prior to arrival. Holiday payments may differ. We accept VISA, Master Card, Personal Check or Money Order. Should your personal check be returned for any reason, there will be a $35 returned check fee added to your balance. Additional Fees: Each property located in the South Lake Tahoe City Limits is subject to 10% city tax on rent and cleaning plus $4.50 per night (Tourism Improvement District tax implemented by the City of South Lake Tahoe). 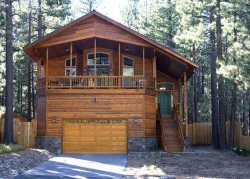 Any property located outside South Lake Tahoe City limits is subject to 10% county tax on rent and cleaning. All properties rented require a mandatory departure cleaning fee ranging from $75-260, depending on size and occupancy of the property. Cancellation Policy: Pre-paid deposit and/or rent are subject to forfeiture. An administrative fee of $125.00 will be applied against all canceled reservations after a deposit is received. Refund of the remainder will be made only if written notice, (by e-mail or mail) is received 30 days or more prior to arrival date, or if accommodations are re-rented. If you choose to cancel 30 days or less prior to your arrival date, you may be subject to paying the full rent amount if we are unable to re-rent the property. Holiday cancelations will be subject to more severe terms. Contact Tahoe Select Rentals for details. CSA Travel Insurance (optional): Optional trip insurance is offered at the time of booking and must be confirmed or denied prior to final payment through Travel Guard. Once trip insurance is confirmed, there are no refunds for the insurance amount regardless of cancellation date. If you file a claim, any money will be refunded by CSA according to their guidelines. CSA Damage Waiver Insurance: Provides coverage for accidental damages to your rental property during your stay, in place of a security deposit. ARDI covers unintentional damage up to $1500. Renters commonly use ARDI to cover things like carpet spills, furniture tears, broken lamps and more. If you are staying in a pet friendly home, ARDI provides coverage for damage caused by pets!